For so many Generations of Pokemon now, a number of different Pokemon Species have certain appearance differences depending on their gender. This same aspect continues in Pokemon: Let's Go, Pikachu, being seen in none other than your Starter Pokemon! That's right! 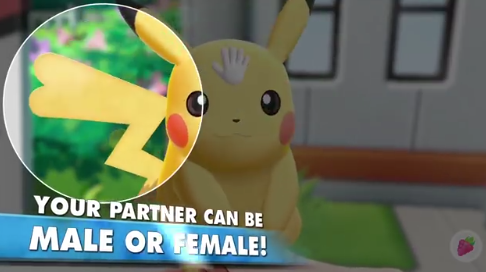 Even though you won't have the option of having any other Starter Pokemon outside of Pikachu, the gender of said Pikachu will be completely random and it will show if you look closely at its tail. If your Pikachu is male, it will have a spiked end to its tail; if it's female, it will have a heart-shaped end to its tail.